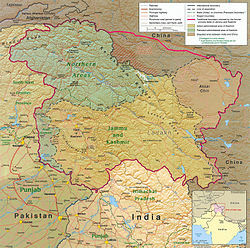 ↑ Jammu and Kashmir is a disputed territory between India, Pakistan and China. The areas of Azad Kashmir and Gilgit-Baltistan administered by Pakistan and Aksai Chin region administered by China are included in the total area. ↑ Desk, The Hindu Net (2017-05-08). "What is the Darbar Move in J&K all about?". The Hindu (in English). Retrieved 2019-02-23. ↑ "Satya Pal Malik sworn in as Jammu and Kashmir governor". The Economic Times. Press Trust of India. 23 ᱟᱜᱚᱥᱴ 2018. ↑ "BJP-PDP alliance ends in Jammu and Kashmir LIVE updates: Mehbooba Mufti resigns as chief minister; Governor's Rule in state". Firstpost. 19 ᱡᱩᱱ 2018. Retrieved 19 ᱡᱩᱱ 2018. ↑ "Saser Kangri - AAC Publications - Search The American Alpine Journal and Accidents". publications.americanalpineclub.org. Retrieved 2019-02-14. ↑ Raina, A.N. "Climate Patterns and Climatic Divisions". ↑ "Jammu and Kashmir Budget Analysis 2018-19". PRSIndia (in English). 2018-01-19. Retrieved 2019-02-24. ↑ "Sub-national HDI – Area Database". Global Data Lab (in English). Institute for Management Research, Radboud University. Retrieved 25 ᱥᱮᱯᱴᱮᱢᱵᱚᱨ 2018. ↑ ᱘.᱐ ᱘.᱑ "Report of the Commissioner for linguistic minorities: 50th report (July 2012 to June 2013)" (PDF). Commissioner for Linguistic Minorities, Ministry of Minority Affairs, Government of India. p. 49. Archived from the original (PDF) on 8 ᱡᱩᱞᱟᱭ 2016. Retrieved 14 ᱡᱟᱱᱩᱣᱟᱨᱤ 2015. ↑ Khan, N. (2012-08-06). The Parchment of Kashmir: History, Society, and Polity (in English). Springer. p. 184. ISBN 9781137029584. ↑ Aggarwal, J. C.; Agrawal, S. P. (1995). Modern History of Jammu and Kashmir: Ancient times to Shimla Agreement (in English). Concept Publishing Company. ISBN 9788170225577.